The pollution episode across London is due to continue albeit at a slightly lower level until later this week, reports King’s College London. Trick of the light? Pollution appears to be visible in the sunlight streaking across Hanson Street this morning. “The long period of cold settled conditions has allowed pollution to build over several days and with no significant change in conditions. Widespread ‘high’ particulate pollution is expected on Wednesday with an small chance of ‘very high’ at some busy roadside locations,” states the forecast from King’s College. 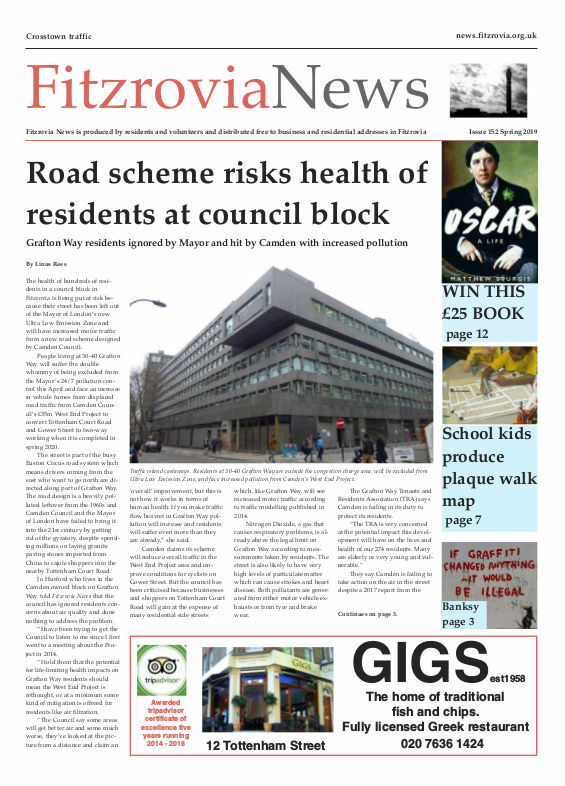 While some older residents told Fitzrovia News they were experiencing breathing difficulties and others reported sore eyes, drivers seemed to be carrying on as normal, sitting in their cars this morning keeping warm and idling their engines. On Monday Mayor of London Sadiq Khan issued his first “very high” pollution alert but offered little of any use to combat this or future toxic episodes.